Wandering Around in the Dark? I am so honored to be a part of today’s blog tour for Cecil Murphey. I know you will enjoy reading what he has to say. 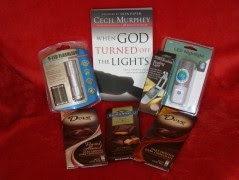 One name will be selected from this post to go into a drawing on October 22 for a gift basket, which includes When God Turned Off the Lights, 1 book light, 1 LED nightlight, 1 LED flashlight, and select dark chocolate, and can be seen on the bottom of this post. To enter, be sure to leave a comment at the end of the post. About the Author: Award-winning writer Cecil Murphey is the author or co-author of more than 100 books, including the “New York Times” bestseller 90 Minutes in Heaven (with Don Piper) and Gifted Hands: The Ben Carson Story (with Dr. Ben Carson). He’s also the author of When Someone You Love Has Cancer and Christmas Miracles, both 2009 releases. Murphey’s books have sold millions and have brought hope and encouragement to countless people around the world. If you sincerely desire to follow Jesus Christ, life won’t always be easy. Many times the Bible promises victory, and you may need to remind yourself that there can be no victory without struggling and overcoming obstacles. In my book, I used the image of God turning out the lights because that was how I perceived the situation. I felt as if I walked in darkness for 18 months. We all interact differently with God, and my experience won’t be the same as yours. Even so, most serious Christians have times when God seems to turn away or stops listening. And we feel alone. Perhaps it’s like the time the Israelites cried out to God for many years because of the Egyptian oppression. “God heard their groaning, and he remembered his covenant promise…and knew it was time to act” (Exodus 2:24 NLT). God hadn’t forgotten, of course, but from their perspective, that’s how it must have seemed. It may seem like that to you if you’re going through your own form of darkness. 1. Ask God this simple question: “Have I knocked out the lights by my failures? Have I sinned against you?” After you ask the question, listen. Give God the opportunity to speak to you. 2. Don’t see this as divine punishment (unless God shows you it is), but consider the silence an act of divine love to move you forward. This is God’s method to teach you and stretch you. 3. Avoid asking why. You don’t need reasons and explanations–and you probably won’t get them anyway. Instead, remind yourself that this temporary darkness is to prepare you for greater light. 4. Say as little as possible to your friends. Most friends will want to “fix” you or heal you and they can’t. They may offer advice (often not helpful) or make you feel worse (“Are you sure everything is right between you and God?”). 5. Stay with the “means of grace.” That is, don’t neglect worship with other believers even if you feel empty. Read your Bible even if you can’t find anything meaningful. I chose to read Lamentations and Psalms (several times, especially Lamentations) because they expressed some of the pain and despair I felt. 8. Pray these words daily: “But who can discern their own errors? Forgive my hidden faults” (Psalm 19:12 TNIV). Some versions say “secret sins.” These are failures and sins of which you may not yet be aware. One of the purposes of your darkness may be to bring those hidden problems to light. 9. Ask God, “What do you want me to learn from this experience?” You may not get an answer, but it’s still a good question. Continue to ask–even after the lights go back on again. If you’re open, you will learn more about yourself and also about God. 10. As you receive “light” about yourself while walking in darkness, remind yourself, God has always known and still loves me. You can find Cec at his site, The Man Behind the Words. 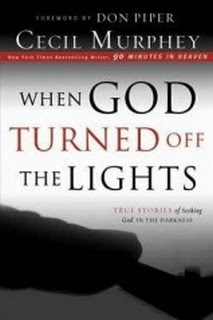 When God Turned Off the Lights can be purchased at Amazon.